Pentecost! We praise God and congratulate ourselves at being the recipients of the Holy Spirit. What wonder happened that day! After receiving the Holy Spirit, the timid disciples became fireballs speaking of Jesus and the marvel he is and the good he does. They are truly on fire with the love and message of Jesus. Another wonder is that the people listening to the apostles hear their words in their own language! Imagine that you are in an international airport at Gate 17 and over the loudspeaker comes a message: “Flight 2250 scheduled for Gate 17 is changed. Flight 2250 will leave from Gate 48”. You immediately hurry toward gate 48 when you stop short. The message was not in English or any language you know. Perhaps it was Swahili, or Croatian. How did you understand the message! That is something like what the people in Jerusalem felt when they heard the apostles speak. 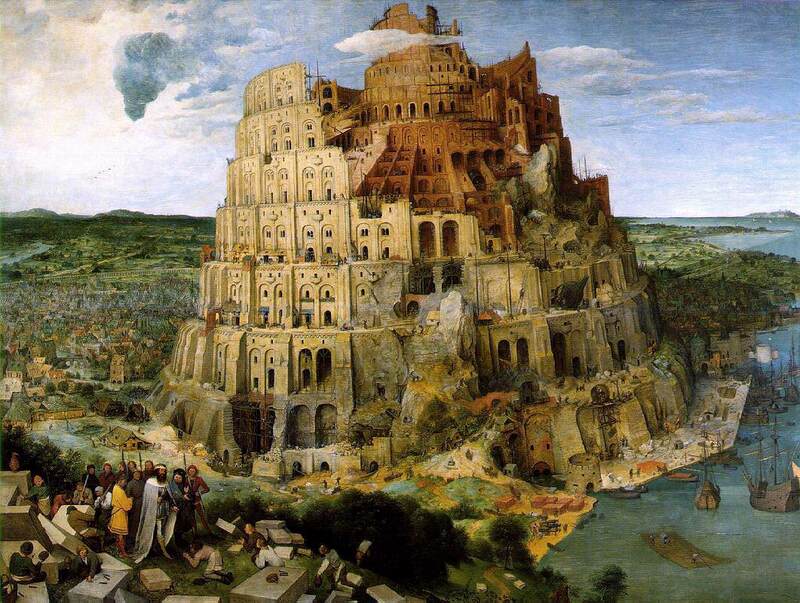 Prior to the attempt to build a tower to heaven, Babel, all people on earth spoke the same language. The tower of Babel was constructed of brick and mortar. These are man-made materials. Marble and granite are made of lava and materials created by God. The message of the tower of Babel was “We can make a name for ourselves by building a tower of man-made materials all the way to heaven.” Their foolishness brought about the confounding of their speech, so no one understood the other. Imagine asking for bricks of a certain size and have the brick maker look at you as if you were speaking silliness. The tower would not rise significantly! Then God scattered the people to distant lands and different colonies emerged. It was the beginning of diversity among the peoples. On Pentecost, thousands of years later, the Spirit totally reversed the situation of Babel. It was not that no one understood each other, but that everyone understood and in their own language. What a smack between the eyes that was! And us, what kind of tower are we building in relationship to others. Do we use words that they do not understand? That is often a problem with very educated people. They speak in the words of their education and not of the people they are trying to reach. For example, while I was working as Family Life Director in the diocese of Gaylord, Michigan, I would give workshops. I had one titled “Familial Relationships”. Four people signed up. But when my “boss” told me to change the title to “How You Get Along At Home” I had 37 people in the session. I had become too esoteric in my presentations. Oops! I did it again. Esoteric is not a word in general use among people. Simply stated it means language that is used only by a certain group of people e.g. something only educators know, or something cooks understand, or Mathematicians. Do we make sure people understand us? Think about it. Pentecost! We can feel the mighty wind as the spirit comes to the disciples in the first reading. As we envision all the people of many nations listening to Peter, we can add our own city–Cincinnati, Oldenburg, Indianapolis, St. Louis, San Francisco, Miami–wherever we are, as we take the energy of the Spirit into our own lives. The second reading from Corinthians reminds us that these gifts of the Spirit are to benefit the world. What are your Spirit gifts? How do they help fill the world around you with positive energy? Dear Jesus, Prince of Peace, you gave peace as your gift when you were on the earth. As we are re-energized by your Spirit, help us be peacemakers each day. It was incredibly beautiful. Small as it was, it stopped me in my tracks. One-half a bird’s egg gave evidence of the new nestling in the tree. The color is what caught my eye. That lovely blue is so distinctive that we call it Robin’s-egg blue. I picked up the empty eggshell still in wonder at the marvelous hue. It was as if a treasure dropped at my feet. There was no evidence in the tree branch a yard away that there was a nest there. Where had it come from? I brought the half shell into my office and placed it on my desk. There it sat for ten days. Visitors asked about it and I knew I would be telling you, my friends, through this Reflection. One such visitor asked me if I knew why the shell seemed so far out of place from any nest. I did not, so I asked for an explanation. The mother bird knows that the eggshell has remnants of her nestling in it and that could attract predators. She takes the empty shell flies a good distance from the nest and drops it. We might learn to take the tempting temptation before us, and figuratively at least, drop it away from our consciousness. I kept wondering about the color. I knew that ground birds like the plover lay spotted eggs to camouflage them like the sandy ground where the birds make their the nests. Orioles and other birds that lay light color eggs hide them in clefts or deep nests. In this way, they are less prominent to predators. However, I could not find a reason for the lovely blue of the robin’s eggs. Wikipedia gave me interesting facts about the color of several birds’ eggs, but admitted that scientists cannot determine why the robin’s eggs are blue. I think I have the reason. It was to give people like us a picture of beauty where it is not necessary. Here I was on a concrete walk, and there before me was a tiny object of such beauty that I had to stop and admire, wonder and even take it into my office. If the sweet blue of that egg does nothing more than lift my senses, it is worth every moment of its short existence. We might remember that any act of beauty we perform need not be in place and time that will find it noticed and admired. Anywhere is a good place to do something beautiful for God, to quote Mother Teresa. Smiles are beautiful and are needed by the persons who seem less deserving. Every person deserves beautiful smile: old or young, rich or poor, clean or dirty, holy or sinful, gracious or rude, pleasant or tiresome. And smiles cost no money, only a moment of time. Perhaps it does not seem like an apt comparison, but you might try to be like the beautiful broken shell that drew a smile from me, just by being. As we celebrate the Ascension of Jesus into heaven we are reminded that we are not left alone. The Holy Spirit is promised to come upon us to strengthen us, to give us wisdom, insight and understanding. In the recent election of Pope Francis, I believe we witnessed the Holy Spirit’s presence very tangibly. We are to be witnesses to the good news; we all are called to live the Gospel, to allow the power of the Holy Spirit to be at work in us. We are to be Christ’s presence on Earth, to live simply, to act justly, to love tenderly all of creation. In and through Pope Francis we are invited to care for the lowly, the poor, to be persons of peace, to respect the environment and to walk side by side, being Christ in our world and in the universe. We are blessed by Christ as we remember his ascension into heaven–we are his manifestation of love and compassion in our world. O God, we thank you for making us your Image and Likeness. We thank you for calling us to be your Presence of goodness, love and compassion in our world, our universe. We thank you for Pope Francis who lives your Gospel and leads us. Amen. Wind comes in all shapes and sizes: the sweet breeze on a summer night, the frolicking breeze on the grasses of the plains, the salty spray in the breeze of the ocean. Today the wind came like a giant lion’s roar, as it pushed the puffy clouds together and made them hide the sun. Just as quickly as it came it subsided, only to gain strength to push once more against all that came in its way. I love the wind. It is so spontaneous. Too often we think of wind as destructive. Cyclones, tornadoes, gales do indeed bring havoc, but the wind of the spring rains and the power in the spring windy thunderstorms are just what Mother Earth needs. Crops use their lesser powers of resistance to try to withstand the wind’s greater strength, and in doing so strengthen their own. Just feeling the wind in my face seems to free me from any heaviness I am holding. Today the wind blew me and my cart more quickly to work. I am aware that in the Old Testament the prophet said that in seeking God you would not find God in the raging gale or the blustering wind or even in the sweeping wind. Only in the gentle breeze will God be found. It is true. If you want to commune with God it will be with a gentle breeze. However if you want to contemplate the power of God, the overpowering force of the almighty, the heavy winds are a good place to start. We have seen the power of a tornado, a cyclone, and a hurricane. We know that wind can move almost anything. Jesus used a gentle breeze from his mouth to imbue the apostles with strength and determination. That same Spirit breathed into us at Baptism will whip into a fine wind as at Pentecost, and strengthen us, too. We must be aware of the Spirit’s presence. A mighty wind ruffling all around us and our own clothing and hair, can be as good a reminder as any. Whenever the wind is blowing hard, think not so much of your hair or papers or flapping jacket. Let the Spirit who comes in the wind fill you with strength and joy. In the gospel Jesus gives us the key to life, “Peace I leave with you.” Later he reassures us, “Do not let your heart be troubled or afraid.” The peace about which Jesus speaks is not the peace at which nations try to arrive. Jesus offers to us peace of heart which comes when Jesus becomes the center of our life and values. In what ways do I enable Jesus to be present in my heart and my decisions? The strength of the early Church members came with the arrival of the Spirit in their individual hearts. Do I trust the leading of the same Spirit, which I received both in Baptism and Confirmation? Spirit of God, come into my life to be the center and the strength of all that I do. Give me wisdom to live my life as you would have me to do. Amen.